Woke up at 4.30 with a warhammer craving. I started painting on a half done Elysian Drop Troop with a Lascutter. Since I use a lot of washes in that colour scheme I needed something to do while waiting for the mini to dry. 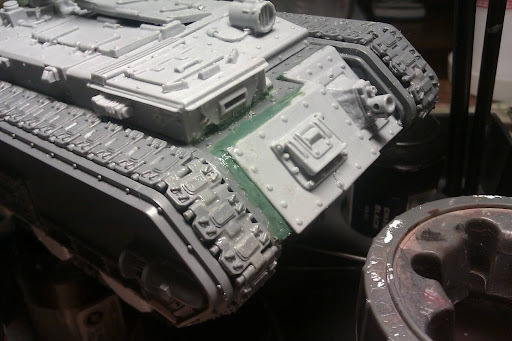 I found a Forge World Chimera front that I had no use for and made it fit my Trojan. Since the tank already had a front it took a bit of greenstuff to make the edges nice. 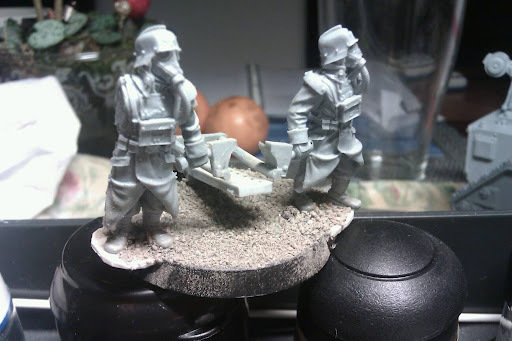 While waiting for the greenstuff to dry I started to glue some Death Korps. My army is growing fast, so my big challenge now is to make the units as different as possible. The result is a two men unit dragging a medusa shell, one watchmaster with a plasmapistol and a guardsmen at ease made from one of the Centaur crew. Hopes no one gets upset. I'm with kristian on this. but nice work. love the chime front. I had that rock thought first but then I felt strange, I believe if I would use a medusa I would definitely put it on a flat spot. Especially if you think of loaders, they don't wanna roll that gunshell over any rocks! Risky business.